Best known as: The four-brother band who sang "Grind With Me"
A product of the Miami music scene, Pretty Ricky began as a band of four young men who went by musical pseudonyms: the rappers Slick ‘Em, Baby Blue and Spectacular, and the crooner Pleasure P.
In 2004, Pretty Ricky’s single “Grind On Me” began to get heavy airplay on Miami radio, which lead to a deal with Atlantic Records and national exposure. The band specialized in synthesizer-heavy R&B with lyrics that were heavily romantic and often raunchy; “Grind With Me,” a sanitized version of their hit single, powered their debut album Bluestars. Pleasure P left the band in 2007. 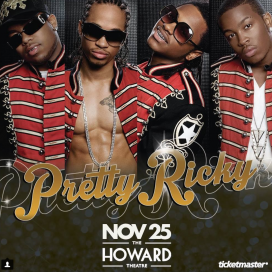 Pretty Ricky used a succession of lead singers, including vocalists 4Play, Lingerie and J. Long, before Pleasure P returned to the band in 2015. The group’s later albums include Eighties Babies (2008, previewed but never formally released) and the extra-naughty Pretty Ricky (2009, with the single “Tipsy In Dis Club”). In 2018, the reunited band began appearing on the VH1 reality show Love & Hip Hop Miami. According to a 2005 story in The Miami Herald, the brothers “were originally called Pretty Rickie and the Maverix, until the country group the Mavericks objected, and the brothers decided ‘y’ endings are ‘more masculine’ than ‘ie'”… Baby Blue began going by the name Diamond Blue in 2007, but has since used both names… Joe Smith is no relation to polygamous Mormon leader Joseph Smith.